You can make as many of the elements you like to make your garland look as full as you like too! 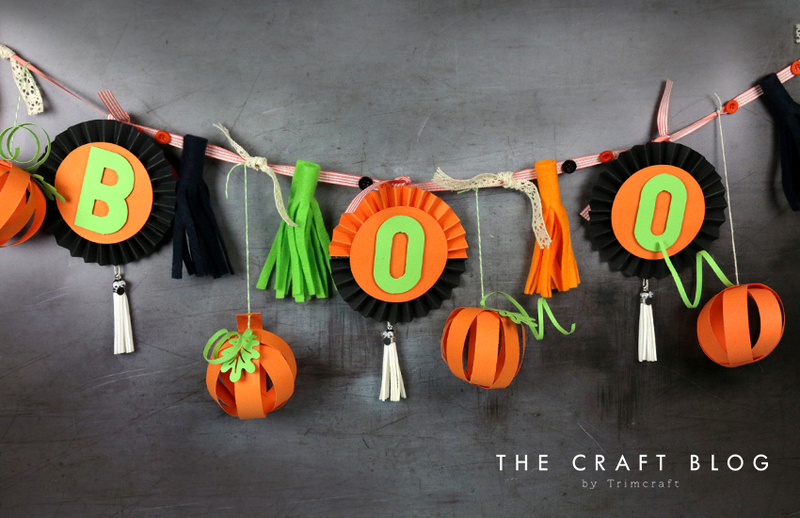 Why not even make individual pumpkins or tassels to string up around your home if you’re hosting a party? Your guests will love the frightfully fun detail! 1. Cut two 5cm strips of orange and black cardstock and score them at 1cm intervals. Adhere the two strips together and concertina. 2. Adhere the ends of the strip together and fold inwards to create a rosette shape. 3. Adhere a circle to the front and back to hold in place. A hot glue gun is best to use for this as it sets more quickly. 4. Repeat twice more, and cut the word ‘Boo’ in green card using the Alphabet Punch Board. Adhere each letter to each rosette. 5. Cut four strips of orange card, adhere them across each other as shown. Bring the other ends together and adhere, to create a pumpkin shape. 6. Cut a thin strip of green card and roll around a pencil to curl. 7. Adhere to the top of the pumpkin, along with a die-cut leaf and length of twine. 8. Take your white Dovecraft tassels and apply googly eyes and a black circle to make a mouth to the top to create your ghosts. 9. Thread the tassel ghosts with twine and then adhere the end of the twine to the back of the rosettes. Add a strip of ribbon to the back too, as shown below, with a circle over the top to cover the ribbon and twine. 10. Cut a generous strip of orange felt and make slits along the felt at intervals. 11. Roll and adhere to create a tassel. Repeat with green felt to make a second tassel. 12. Cut a long strip of ribbon, attach the elements to the ribbon, finishing off with some lace ribbon to complete your garland. You now have your finished garland! What do you think to this make? Spooktacular or what?! We’d love to see your versions of our Halloween garland in the Inspiration area, so please show us if you create your own! If you upload to social media, please #Trimcraft so we can see your wonderful makes too!